This installment of Car Week ends as it started, featuring a 1961 model year convertible. 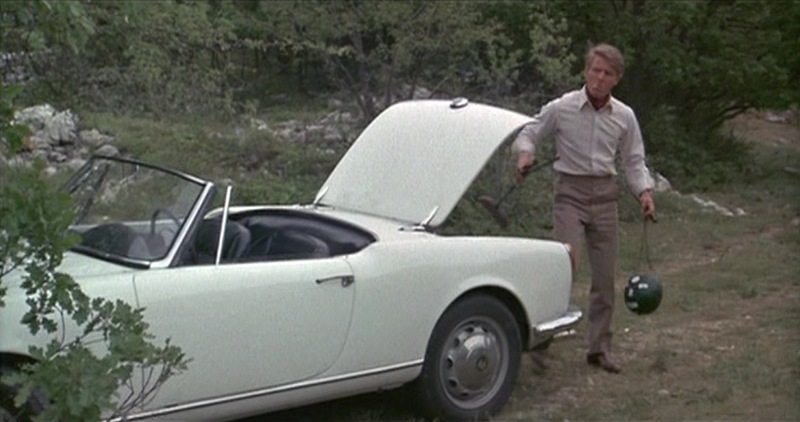 In this case, it’s the white Alfa Romeo that “The Jackal” – as our smooth assassin is codenamed – drives through Europe, including for this brief interlude as he tests his new customized sniper rifle in the Italian countryside. The Jackal owns a realistically limited wardrobe of light earth-toned shirts, suits, jackets, and trousers that help him blend in as he traverses Europe in his quest to assassinate De Gaulle. 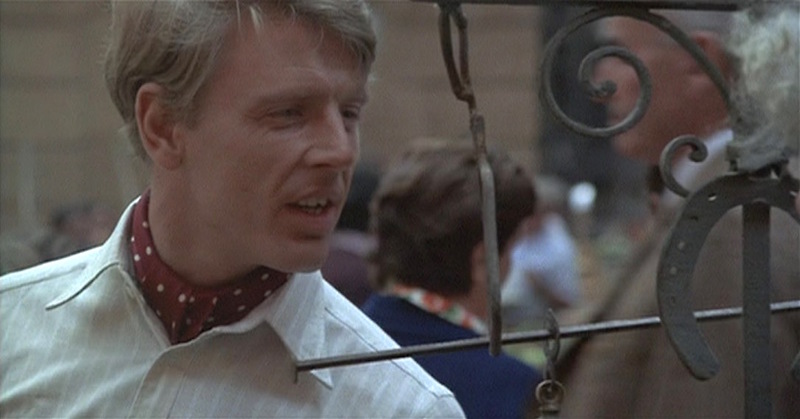 The day cravat – often incorrectly referred to as an “ascot” – is a staple of The Jackal’s undisguised wardrobe that adds a polished touch for a character that believes in his own standards of dress. 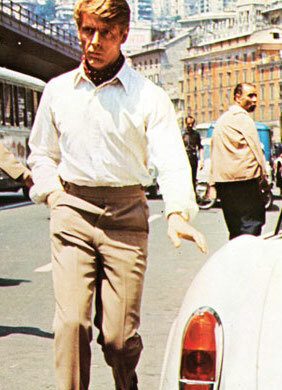 In 1963, it would have been less dignified for a gent to wear only a shirt and trousers with no jacket, so The Jackal foregoes the standard neckwear of a long tie and dresses up his warm-weather casual attire with a series of patterned day cravats that also prevent his earth-toned ensembles from being too suspiciously inconspicuous. 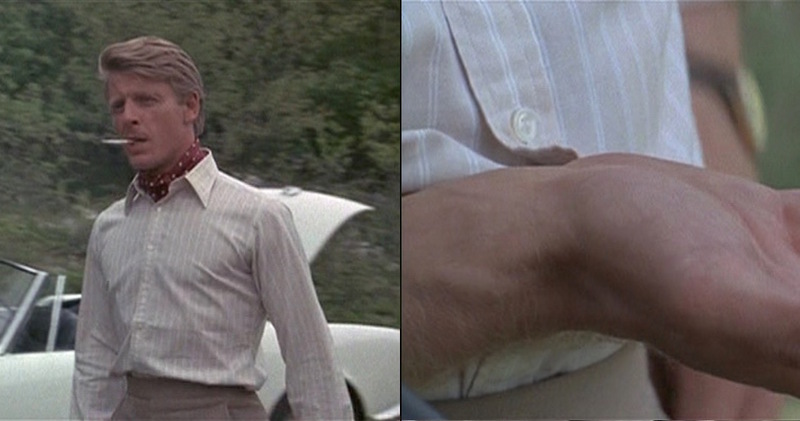 For his afternoon of buying and shooting melons, The Jackal wears a maroon soft silk day cravat with white polka dots, worn under the unbuttoned collar of his shirt. He was previously seen wearing this same cravat during a brief stop in Paris, where he wore it with a light brown odd jacket and tan trousers. 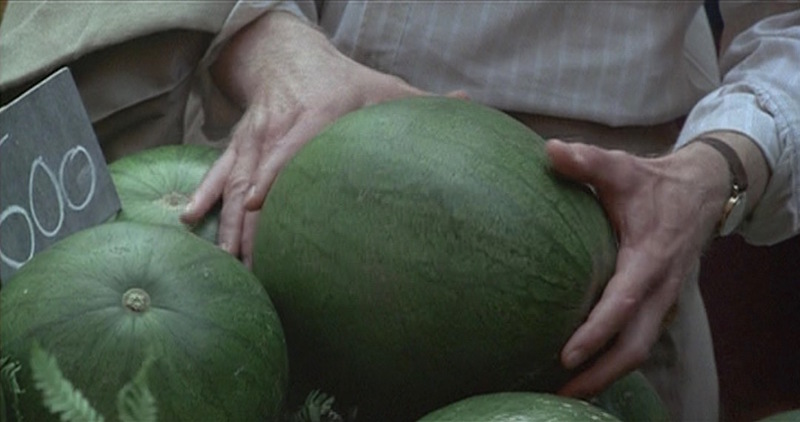 The Jackal negotiates for his melons. The Jackal wears taupe gabardine flat front trousers with a long rise and an extended tab that secures in the front with a hidden hook closure. The side pockets are slightly slanted, and the back has double “Keystone”-shaped darts on each side with no pockets. Though fitted through the hips, the trouser legs slightly flare out to the plain-hemmed bottoms. The Jackal previously wore these taupe trousers to the British museum and spends much of the film wearing a similar pair of a warmer tan shade. The Jackal’s preferred footwear throughout the movie is a pair of brown leather double monk-strap loafers with taupe socks that correctly continue the leg line of his trousers. A white car is easy to disguise when needed just by painting it a different color… in this case, blue. The Jackal approaches his wardrobe with the same sensibilities; it’s hard to tone down loud clothing if needed, but it’s certainly easy to disguise blander clothing by adding new elements. Unobtrusive like the rest of his wardrobe, The Jackal wears a plain yellow gold wristwatch with a round case, light gold dial, and brown leather strap. The limited palette of his clothing makes his disguises that much more effective. The word “beige” itself is derived from the French term for natural wool that has been neither bleached nor dyed; thus, The Jackal in his beige clothing is an empty bland palette, quick to blend in with any added garment serving as an easy disguise, if needed. 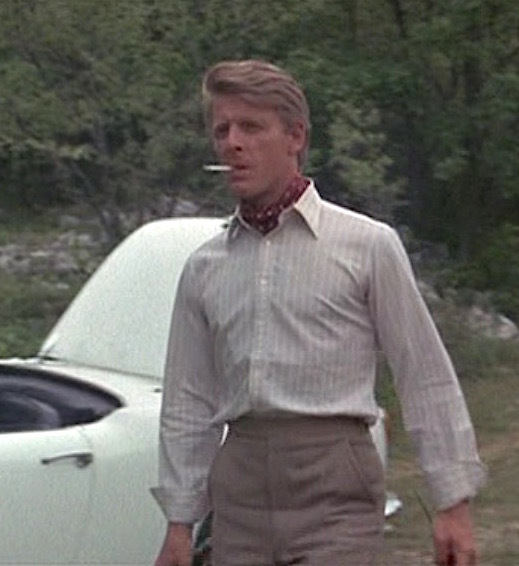 The Jackal’s beige, taupe, and earth-toned clothes match Edward Fox’s hair and complexion to create a subconsciously bland effect with only his colored and patterned silk day cravats breaking up the monotony. 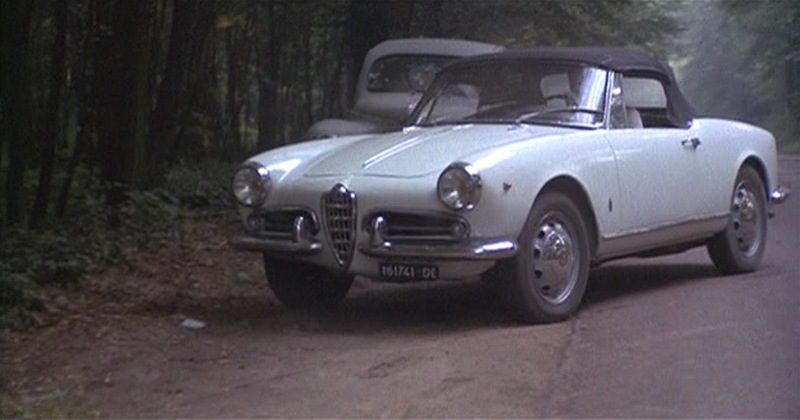 The Jackal zips through Europe in a sporty white 1961 Alfa Romeo Giulietta Spider two-seat convertible. The Giulietta Spider’s 10.2 cubic feet of trunk space is all The Jackal needs for his compact custom rifle and melon. By 1961, the refreshed Giulietta lineup included the Berlina, the powerful Turismo Internazionale (T.I. ), the sporty Sprint models, and the Spider two-seat roadster. The introduction of the Alfa Romeo Giulia in June 1962 marked the beginning of the end of the Giulietta model. The Giulia offered models with two sizes of Alfa Romeo’s venerable Twin Cam engine, the 1290 cc version that was currently found in the Giulietta and the new, more powerful 1570 cc engine for the Giulia only. While the Berlina and T.I. models were slowly phased out by 1965, the sportier Sprint and Spider models were incorporated into the Giulia lineup where they received new life with the new 1.6 L engine. 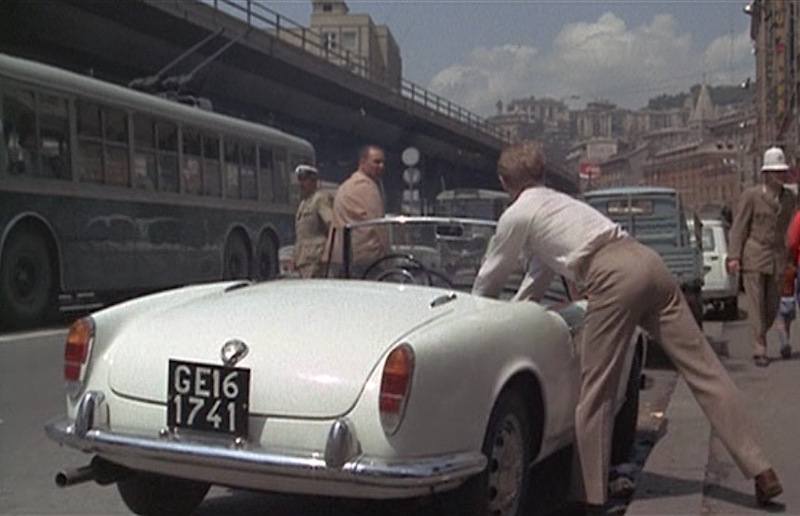 The Jackal’s Alfa Romeo is registered with plates GE 16 1741. The Alfa Romeo Spider would become its own model in 1966 with a relatively unchanged look – also designed by Pininfarina – through four generations of production until the final Spider – the 110,128th ever – rolled off the line for the 1993 model year. It was a 1966 Series 1 Spider 1600 that Dustin Hoffman famously drove as Benjamin Braddock in The Graduate. For his mission to assassinate De Gaulle, The Jackal has a unique bolt-action takedown single-shot rifle custom made for him by a gunsmith in Genoa to fire .22 Magnum ammunition. 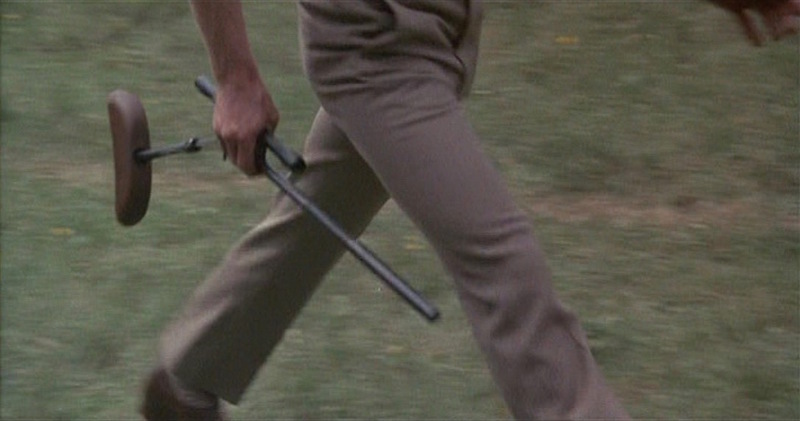 The folding rifle has a telescopic sight, a suppressor, and a broad shoulder stock that would later be incorporated into The Jackal’s disguise. The Jackal initially fires a few standard .22-caliber rounds into the helpless melon to give him a better sense of how to adjust the weapon’s sights. Once he is confident in the rifle’s ability to hit its target, he loads it up with one of the explosive bullets he plans to use on the day of the assassination. 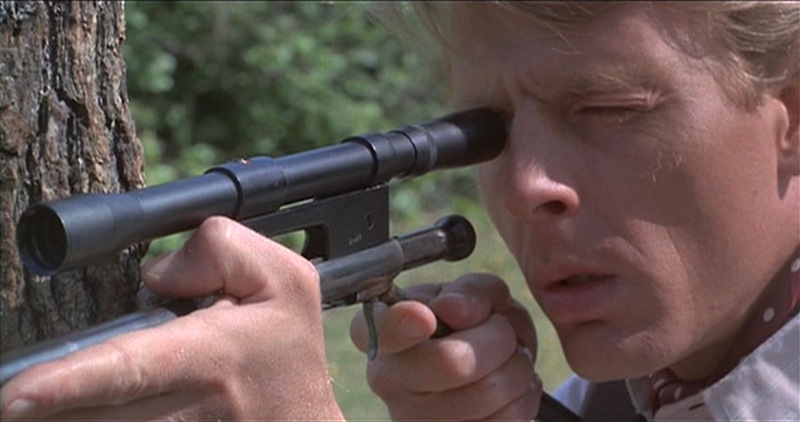 The Jackal adjusts the zero on the telescopic sight. Buy the movie and read Frederick Forsyth’s thrilling 1971 novel. Great review! Did you take notice of his Dopp kit with its repp stripes? A predator matching his natural colouring to his wardrobe, urban camouflage. The Jackal’s striped shirts are mentioned in the novel but the cravats are all Edward Fox, a habit he picked up in the army. The literary Jackal is much served by his dove grey suit & wraparound shades, more like a 60s Vincent from Collateral. I knew you wouldn’t fail me – loved this movie / book and all the characters . I feel his costumes are timeless and would fit in anytime – any where . Thx much for posting !